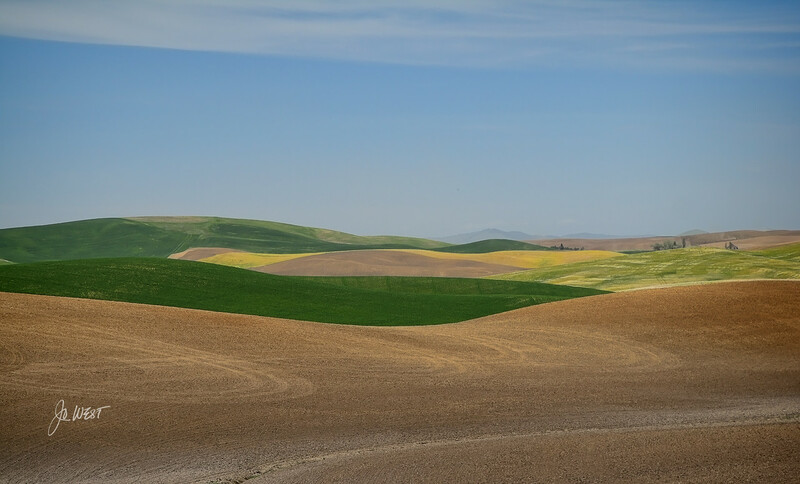 I've been waiting a few years to make the trip to the Palouse area of eastern Washington/western Idaho to capture the beauty of this unusual terrain. The wheat and canola infused rolling loess hills can create a magical portrait of color and texture, and they almost didn’t disappoint. 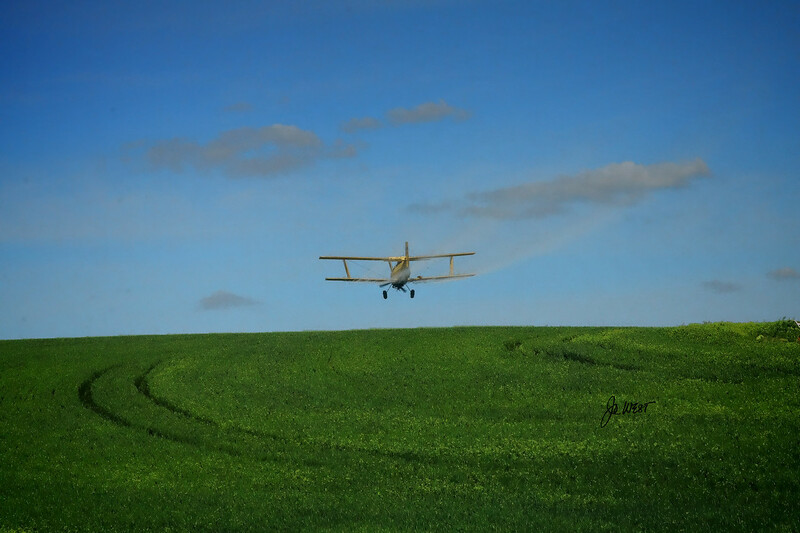 Due to the unusual wet winter this year (winter 2016/2017), the wheat fields were late to be planted and the yellow canola fields were still barren. Hence the lack of yellows and emphasis on green and tan. I was told numerous times, that lighting is the most important thing with dealing with this landscape - early morning (like sunrise) and around sunset are the optimum times. Well, I failed on the timing terribly, didn't get the right lighting to emphasis the rolling beauty, but still had a good time. And as fate would have it, blue bird skies prevailed until the day we left. Once we were gone, the northern lights, thunder storms and rainbows galore moved in. 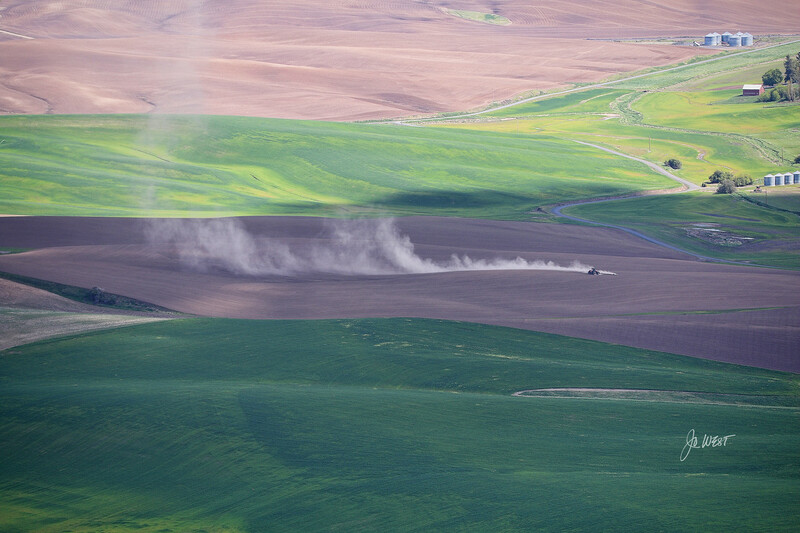 1) From Steptoe Butte (1000 foot butte in the in the middle of the landscape) - the green fields are wheat and the brown are being worked for either wheat or canola. 2) Tractor working the field - the large machine is dwarfed by the size of the fields. 3) And still from Steptoe - Idaho Syringa (the state flower) with a farmhouse in the background. 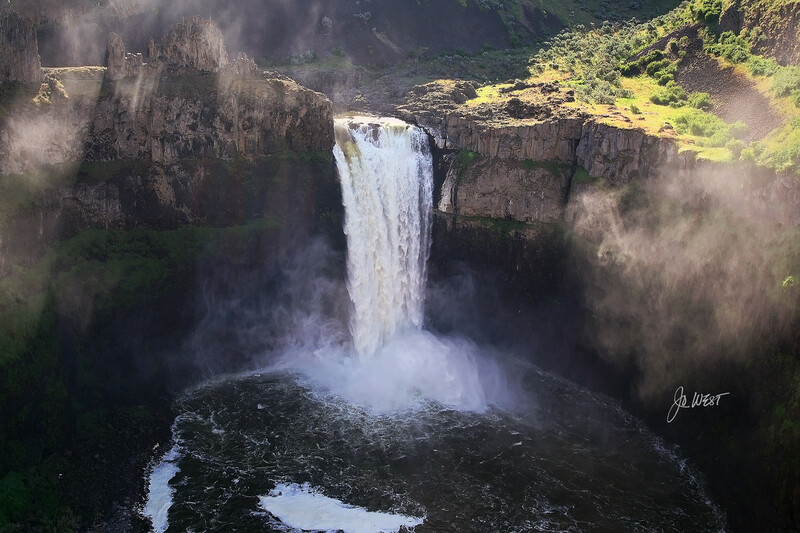 6) The Palouse Falls are Washington's State Falls (not sure why since there are more spectacular falls in the state). 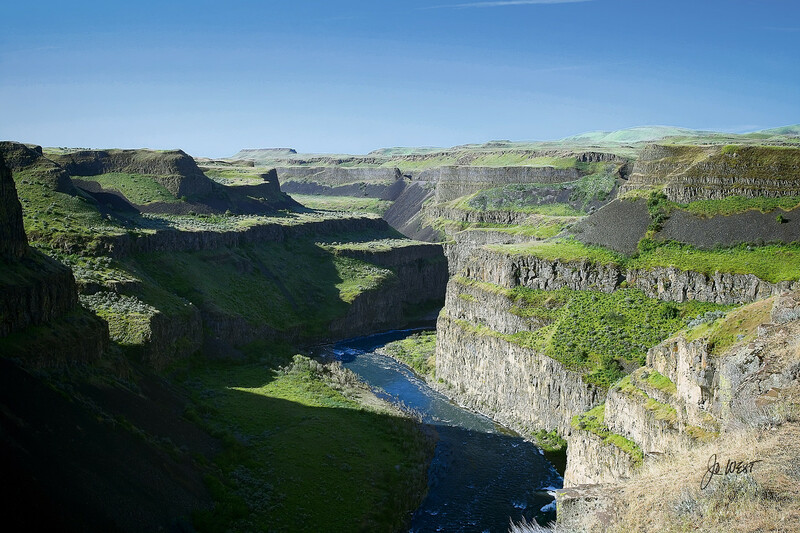 They seem to come out of nowhere, then the Palouse River continues through a lovely canyon. 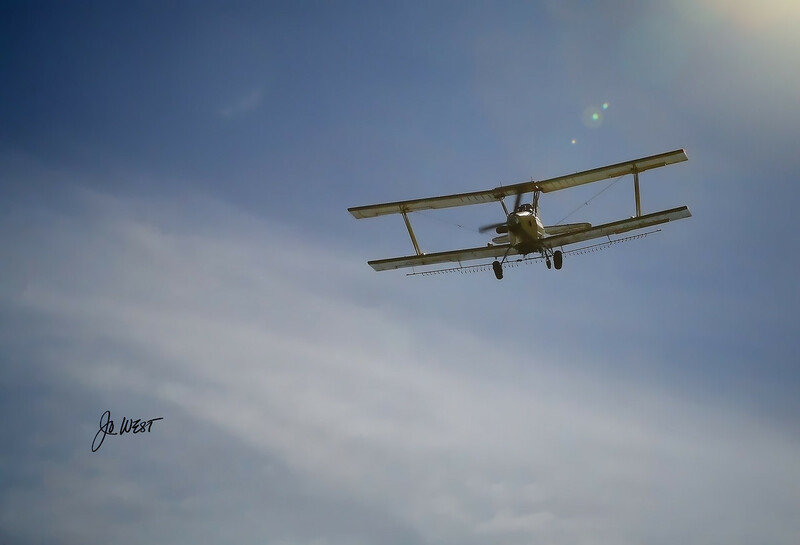 7) Had some fun with crop dusters as well. 8) South of the Palouse area as we were driving through Lewiston, Idaho, we saw some of the most beautiful dogwood trees. 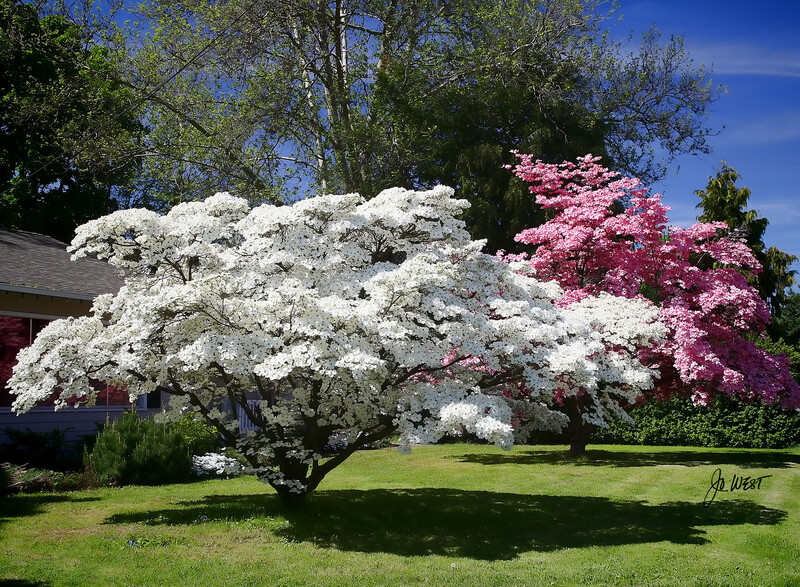 It appeared that most residences and a lot of businesses were proudly nurturing pink and white dogwood trees. 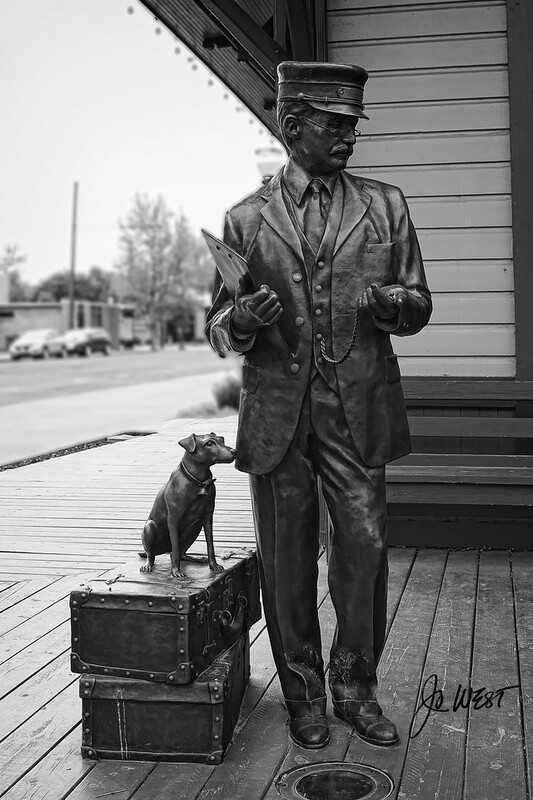 9) Dayton, Washington proved to be a very pretty town with some interesting architecture and I loved the Rail station statue. It turned out to be a long drive, but a fun trip. 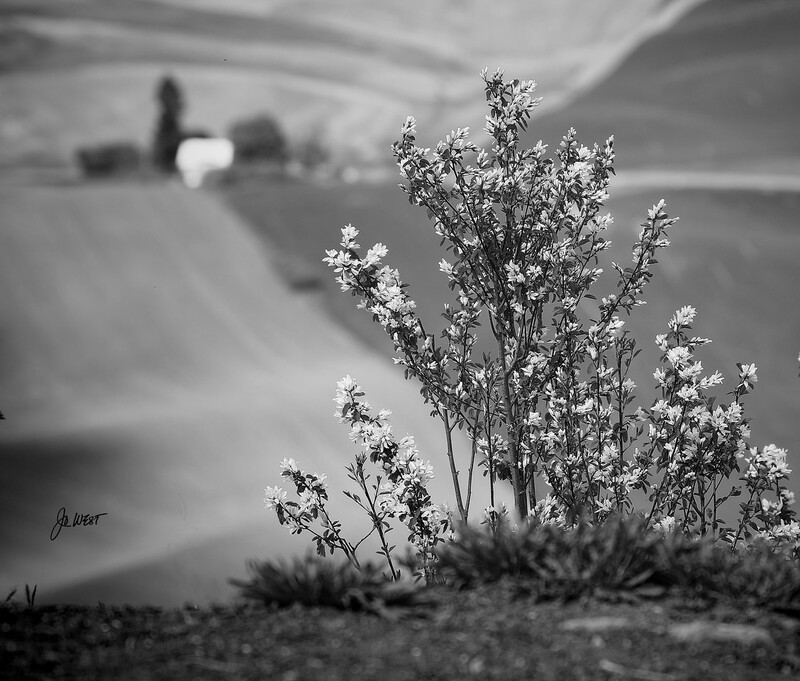 Photographing the Palouse is challenging, so I'd like to go again in the Spring and work the sunrise/sunset timing better. 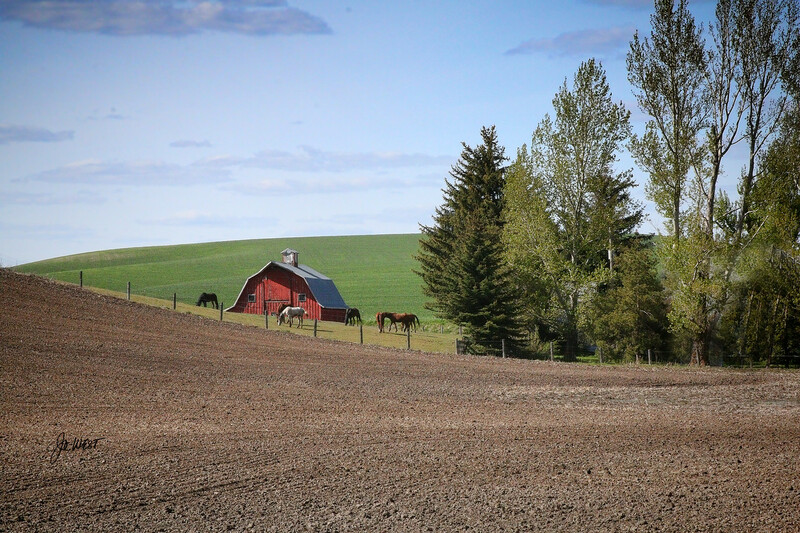 The optimal times to visit the Palouse are in the Spring for the planting of wheat and canola and then in the Fall during harvest. A lot of photographers descend on the area year round, and the locals cater to them. 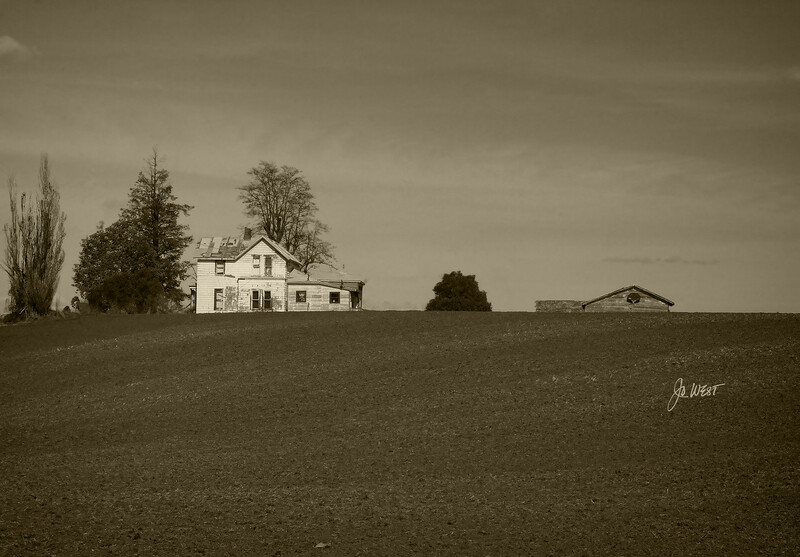 The only thing they really ask is that property rights are respected and that they be asked if one wants to wander the fields for the right shot. I envy that you are within driving distance of this beautiful place - it's definitely on my list of places to visit at least once (and knowing me, probably more than once). My favorites are #2 and #4, with the photo of the falls also jumping out at me. All are wonderful. 4 is also my favorite of the above. While there are a lot of low angle shots like this, there aren't many that end up painterly compositions - and you got one of those with 4. Mid-day light is actually kind to this type of shooting. I was amazed at that aspect of the landscape. I did a workshop there two years ago this week and enjoyed every part of it except the getting up at 3:30am in the night/morning part - yet that's how to get the low angle light that makes the little hills so 3D like. You seem to have navigated and shot many of the must see's, including the falls. 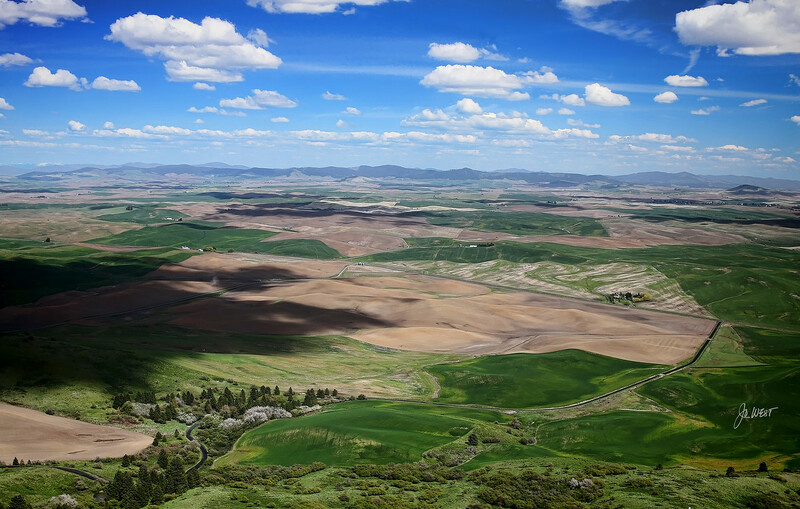 The drive to Palouse Falls is long no matter where you're staying, but I think you'll agree that it was worth it. Quite the canyon in the middle of nowhere. Dogwoods! I didn't know those were there or I would have made the additional trek to find them. Good on you for doing so and posting those. Denise, it's really worth doing the trip someday. Of course, that's easy for me to say since I can drive there in a day and 1/2! Thanks for the comments. David, thanks for the comments and the great info. The one thing I wouldn't look forward to when starting out early enough to get the right light, is navigating Steptoe Butte in the dark!! It was harrowing enough in the daylight, but it's probably worth it in the long run. 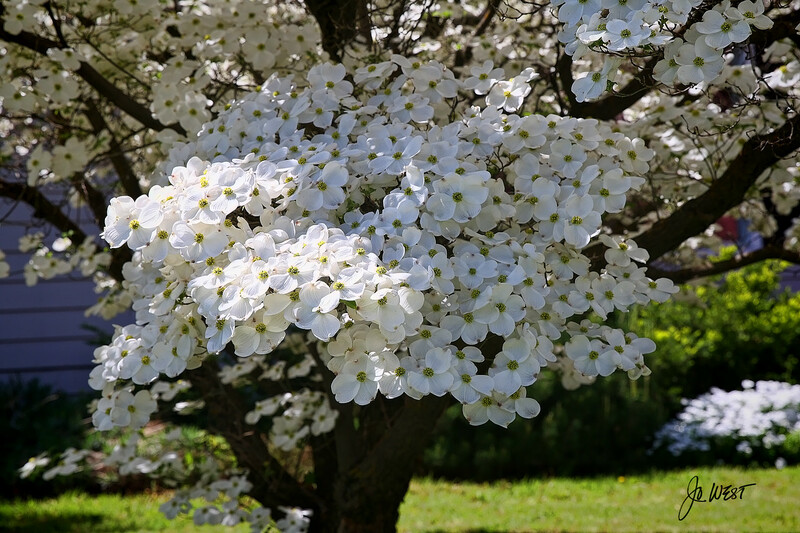 And the Dogwoods were stupendous - we must have lucked out with the timing for them to all be at their prime. I'm going to have to agree that number four is a standout. Beautiful place i really liked all the farming activities 4 and 6 for me. I can feel the place in your photos makes me want to go there. ...and the potholes going up and down, and as someone else was going the other direction! Geez! I did Steptoe 3 times. Once myself in the daylight, and it was treacherous, a 4am trip up in the dark with the workshop instructor driving, and another workshop sunset shoot, then us driving back down in the dark. Finally got used to not dying there. Yes it was all worth it -- for the pics! Steve and Awais - thank you for the kind comments. Very nice, some unique images and shows a part of the country a little less photographed then others. Thanks CaptNemo - I appreciate your comments. Outstanding shots, I think the falls is my favorite. (Hard to choose). I've been to Washington a number of times, as my oldest lives there, but never to this area. I need to go. Thanks for the kind words JimW60. 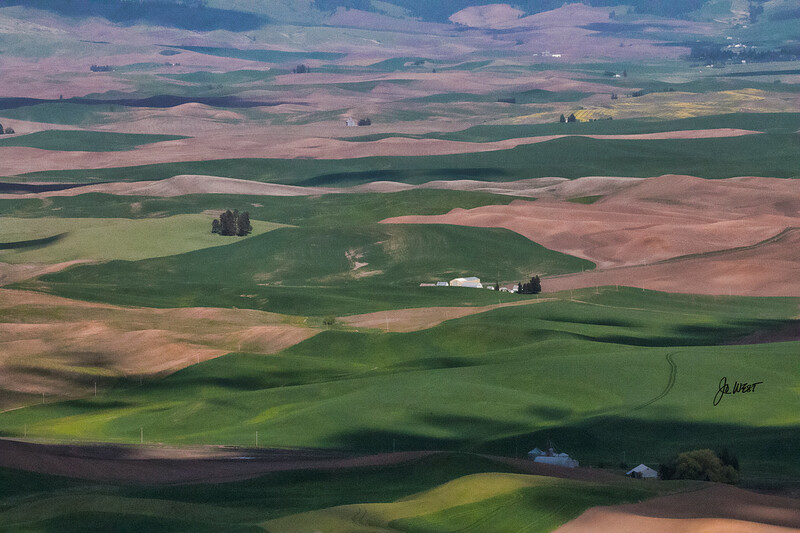 It'd be worth the extra trip when you are in Washington to visit the Palouse area.